"Don't ever let it be forgot, that once there was a spot, for one brief shining moment that was Camelot." At the Golden Globes the other night, Meryl Streep received the Cecil B. DeMille Award, which is a lifetime achievement award. Her speech was mostly about the wonderful diversity that exists in her trade, the fine art of acting, but, at one point she made a comment on the arts directly, basically stating that, if a future government of our country makes well on some of its promises, that there may be no more arts and all that will be left is football and MMA. 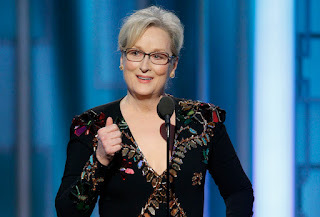 I found this all very funny, until I realized the hard truth about Meryl Streep's comments. The arts are in danger when people enough people believe that they, from Hollywood movies to arthouse cinema to Broadway musicals to a random kid trying to make it as a painter or sculptor, are worthless. This is not a new idea. Looking forward, it's easy to acknowledge a fear that, to quote a great film called Dead Poets Society, the arts are "the things we stay alive for" and will not be valued as much as they have been. Consider the short presidency of John F. Kennedy, a president who championed the arts, who invited musicians and poets and artists to his White House, whose wife, the elegant Jackie, brightened the place from its 1950s drab because she demanded such. And that this respect of not only the arts but of history is the key takeaway from the new film about her life in the days immediately following the assassination of her husband in Dallas on that November day in 1963. Jackie is a haunting experience and as elegant and beautiful as the woman to whom it pays tribute. 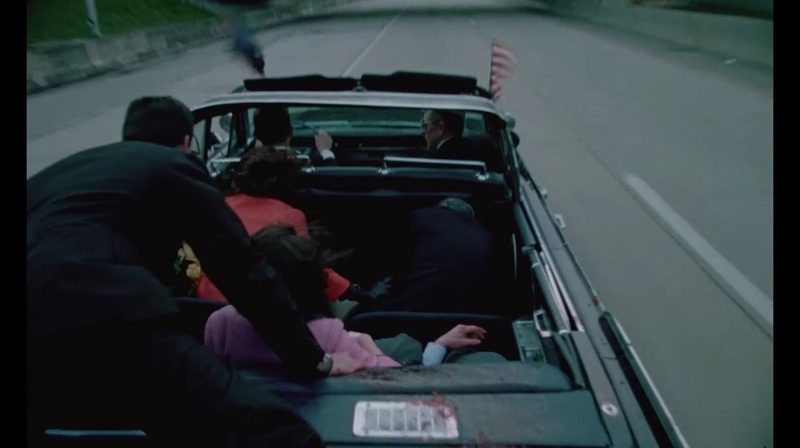 It starts with the widowed Jackie Kennedy (Natalie Portman) meeting with a reporter (Billy Crudup) for an interview, the first and only interview related to her experience in the immediate aftermath of the assassination. The film floats around in the daze of tragedy through this experience, the beginning stages of grief, the shock, the realizations, the confusion, then, of course, the hard truth of actually having to plan a funeral. Questions arise in intimate moments between Jackie and her brother-in-law Bobby Kennedy (Peter Sarsgaard): What is our legacy? A great question. And such an essential one. For, how do we remember the Kennedy White House? That's what this film, NO! this stunning piece of art, wishes to answer. Jackie believed that her husband Jack was a great man (as did many), though, at the time, the nation was divided (sound familiar?). But what we come to understand throughout Jackie is that she was the one who shaped his legacy, the "Camelot" legend, that her husband Jack's presidency was deserving of something as extravagant as a horse-drawn funeral procession through Washington because of his near successes with Civil Rights and the Space Race and promises of peace, because he allowed her to create the most elegant White House in our collective memory as Americans. Director Pablo Larraín and his collaborator's have crafted this film to perfection. Despite a lull here and there, this film is wholly engrossing and moving. Much of that has to do with the music, the score by composer Mica Levi. It is aggressive at first, almost uncomfortable, but it settles in and around every frame of the film and just becomes beautiful and pained connecting us to its visuals, its star, and inspiring emotions we don't often feel at the movies. The movie ultimately hinges, though, on Natalie Portman's lead performance as the title character herself. She nails it. It is the best performance of the year. At times, I found myself fully entranced by her face, the way she shifted her mouth to make the words as Jackie would say them, how she captured the look and sound of Jackie Kennedy so well as to even look like her at times. Credit to Larraín for making the choice to even blend actual footage into his recreations. 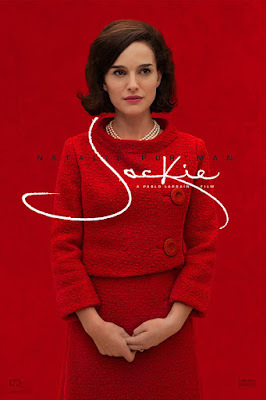 With that, he and Portman were actually able to create the illusion that she is Jackie. Jackie Kennedy, this film tells us, wanted the truth told. 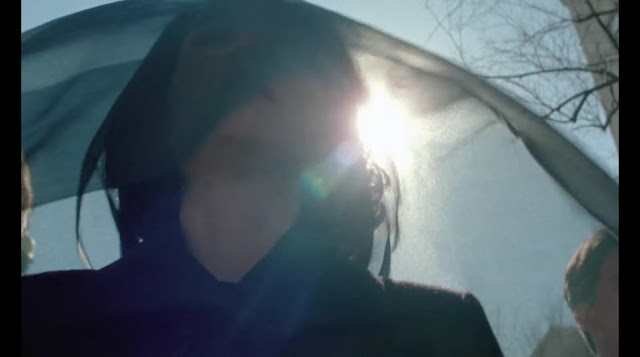 "Let them see what they have done," as she refuses to change from her blood-stained dress. But just the same, she admired history and the arts. Not only that, she knew them as well, and that these things can and should work together. The stories we tell become histories. Toward the end of the film, Jackie tells her priest in a moment of understanding, "I believe the characters we read about on the page end up being more real than the men who stand beside us." How true. Seriously. Close your eyes and think of Jack and Jackie Kennedy. What do you see? Is it real, or is it imaginary? It is a memory of yours, or is it a memory of Camelot? THAT is what a love of art can do. Where will our arts go now? How will the history we are creating right now read? A totally effective, artful piece of cinema that sheds light on a side of the story we never get. The Kennedy Assassination will take on yet another dimension after experiencing this absolute wonder of light and sound. An instant favorite of 2016. Excellent review of a BRILLIANT film. One of the best of the year, so much so that I can't believe it's been reduced to just Portman's performance in terms of awardage. Everything about this is just masterful - the score, the production design, the editing, the cinematography, the script... I can't recommend it highly enough to everyone I know. And now I'm going to tell them to read this review, too. Thanks, Dan. I'm hoping this nabs a score nomination as well as the inevitable one Portman will get. You're so right. This film is just masterful. And thanks for steering people my way. Share it around as much as you want. It's so hard for me to put this in my top 10 of the year. I loved this film, but there were so many other great films this year that I don't know how I can fit this film in my top 10 list. Natalie Portman's performance was astounding. Best performance of the year so far. Cinematography, editing, costume design, production design, makeup & hairstyling, film score - all great. Direction & screenplay - excellent. I still don't know how I can fit it into my top 10 films of the year, though. This year might be so great for film that I may have to do a Top 20 films of the year list. This will make the list if I do that. But seriously, this film was really good. Right on. I rank films based on how much of a high I had after finishing it. This is easily a top ten high of the year for me. It will knock out stuff like The Nice Guys. I'm seeing this on Friday, I can't wait! Yes. Look forward to your review. Wonderful review! I am so looking forward to this mostly because even though Black Swan is my all time favorite movie I never considered Portman to be a very talented actress. She created some wonderful performances but I always thought it was due to good casting and great script. But she seems to go beyond that here, basing this on reviews of the movie. Thanks! I have actually loved Portman since she was a kid in Beautiful Girls and The Professional. There are very few roles I haven't liked her in, at least the ones I've seen. You may be right in that she picks good stuff, which can help any actor. This is an incredible performance, an embodiment of an iconic woman. I'm looking forward to seeing this. I'm a big fan of presidential and first lady history, though it looks like I'll be taking a four year break in a couple of days, so I scanned your review rather than read it in depth. I already know so much Kennedy and Jackie O backstory I'm trying to refrain from knowing much more before seeing the film to retain some freshness. The detail of design looks impressive that's for sure. Hope you get to it soon. I recommend seeing it in a theater if you can. The sound design, specifically the score should so be heard on good speakers. It is one I'm going to try for in the theatres, it looks like a film that can benefit by that experience...same for Hidden Figures. Some films just have that sweep that needs the big screen. Speaking of which, though I didn't see it there Tess would have been a film that would have benefited from that experience. Tess may have been an absolute home run for me if I had seen it in a theater. I love your review! Jackie really moved me in a way I was not expecting. I agree with everything said here and it put into words many ideas I lost while simply gushing in my own review. Sati's link brought me here and I'll definitely be adding you to my feedly reader. Thanks! Glad to have you. And glad you enjoy my work. I just read your review. Excellent! Your description of Levi's score is perfect. I'll do likewise. Nice to meet you.